It is my belief that anything one can imagine, and even vaguely draw on paper, can be made in cloth. Discovering this has freed me so that I have no limits in my work as a quilter. Would you like to be without limits too? I have a particular fondness for machine piecing. The finished look pleases my eye, and most clearly shows my designs to their best. 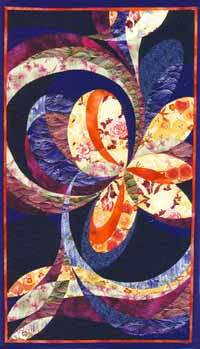 Therefore, all my classes focus on curved seam piecing solutions, color use, and design. BASIC PIECING using "Spring's Delight"
Design, color and the use of texture in fabrics will be discussed. Using my pattern, Spring's Delight, the class will work on curved seam piecing - the skill of making graceful seams which lie flat and intersect cleanly. 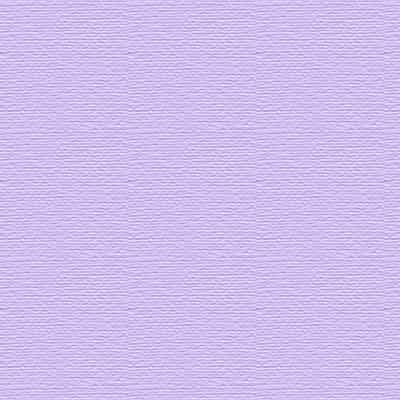 Color and the use of texture in fabrics will also be discussed. The photo at the right is of a 4-patch from the design Spring's Delight. Classes run as one 7 hour session, or two 4 hour sessions. Design, color and the use of texture in fabrics will be discussed. Using my design, Haiku, we will work on curved seam piecing, Y-intersections, and sewing oddly crossing lines so that they are clean. Color and the use of texture in fabrics will be discussed. This is a class taught in a 2-day seminar focused on sewing skills. Because of our short time together, I ask that the students do some 'homework' before our class meets. 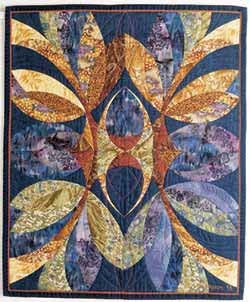 Though I am an art quilter, this is a class which applies to tradional as well as innovative quilting. I focus on design principles as they apply to all forms of design. I will address the rolls that gravity, symmetry, asymmetry, color, value, shape, line, environment, culture, and other elements play in design. This is a six hour class and is best taught with 15 to 20 people. BLOCK OF THE MONTH using "Alien Joy"
Meeting once a month, students will work with a 12-patch design of integrated but different blocks. 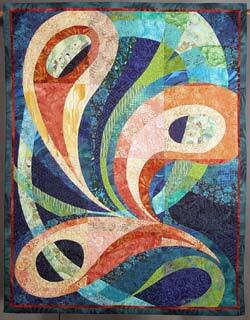 One 12" block at a time, curved seam piecing and the use of color will be taught. Humboldt County classes run 10am-4pm each monthly meeting. Elsewhere other workshop schedules can be arranged. Emphasis will be made on the relationships between colors and the use of color to direct eye movement. We will also focus on dimensionality, transparency, luminosity, value and the textural component of fabric as they effect design. This 7 hour class is indeally taught with a minimum of 15 to 20 students. In a one and a half hour presentation, I will discuss the color wheel and how it can help a quilter to make informed color decisions. The color wheel is a particular help in knowing what color it is that one is actually looking at - for example: a red with blue overtones or one with yellow. The answer determines what color truely compliments that particular red. I also talk about color effects and how to create them as well as the importance of texture and value as each affects design. Each attendee is given a color wheel and a comprehensive handout. CURVED SEAM PIECING using "Nine Patch Skills Challenge"
This class works from a nine patch wall quilt I've designed which features the sewing problems one might encouter in free form design. 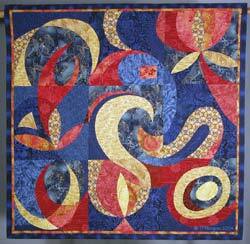 Curved Seam Piecing taught in Humboldt County consist of 4 to 5 hours each monthly meeting. Elsewhere other workshop schedules can be arranged. By working with doodles, you will discover a design of interesting shapes and lines. I'll show you how to enlarge that design proportionally, and to make a pattern from which you will work to create that design in cloth. Throughout the seminar I will teach color, design principles, and sewing skills. By the completion of our time together, you will have completed your design (or nearly completed), gaining confidence in your skills as a fabric artist along the way. The "no limits" feeling will become stronger and stronger. This 5 day seminar class can also be taught over 3 weekends. 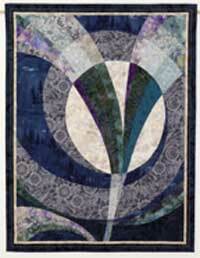 GENTLE CURVES MADE EASY with "Winter Moon"
We will focus on creating gentle curves which are graceful and lie flat. This design also offers the opportunity to play with color and transparency. This might be any sort of moon seen with the tree silhouette reflecting the moonlight. This is best taught as a 2 day class. I am open to suggestion. I have been an art quilter for more than 20 years, having found it necessary to develop many techniques that just weren't being taught. I believe that if there is a specific topic that you would like to address in a seminar or guild format, I can make a contribution. I would be more than happy to discuss any issues you might have and help to design a seminar to cover them. Due to an intensive, one on one teaching format, fees are based on such considerations as class size and level of difficulty of the material. Fees may be negotiated depending on special needs. Please contact Teresa M. Hodgson by email for more information.